In the Stone Age evil spirits were thought to reside in the head. 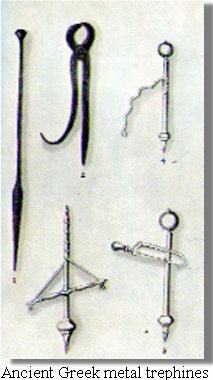 A crude surgical procedure was devised in order to release the evil spirits and relieve the suffering of the possessed victims. A circular portion of the skull was cut using a trephine (from Greek trupanon, border). Apparently, some victims survived the trephination procedure. Recently, historians have suggested that trephination was not an exorcism practice. Rather, trephination was used to remove bone splinters and blood clots.